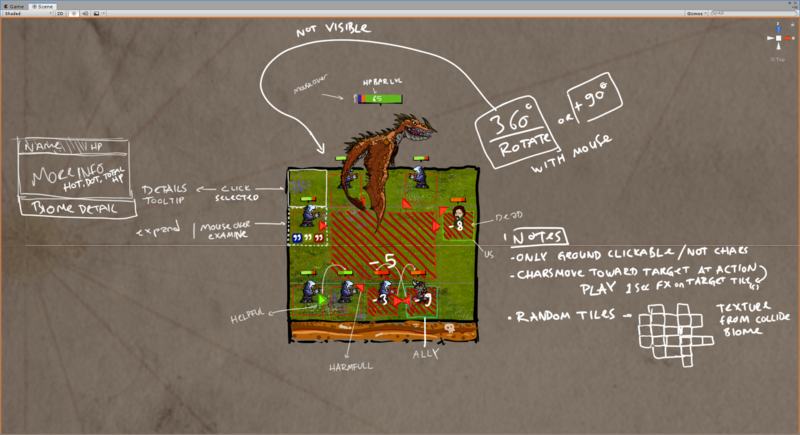 A real-time 4x strategy in a fantasy world. Customize your Adam and Eve, go head-to-head with other races while conducting diplomacy, waging war, and advancing The First Men. When the first men arrived in a strange and undiscovered landscape, they listened to their instincts and adapted to their surroundings. They gathered, chopped, mined and built. But most importantly, they fought to survive. In TFM, almost all of those primal pursuits are either stifled or exploited by the prior inhabitants of the world, meaning the land is not up for for grabs. The chosen characters of a settlement will train to become relentless warriors, archers and all-around skilled adventurers. They come together to form parties to face the danger. They rely on each other, using and combining their combat abilities. Of course, they're not the only ones who fight alongside their comrades. 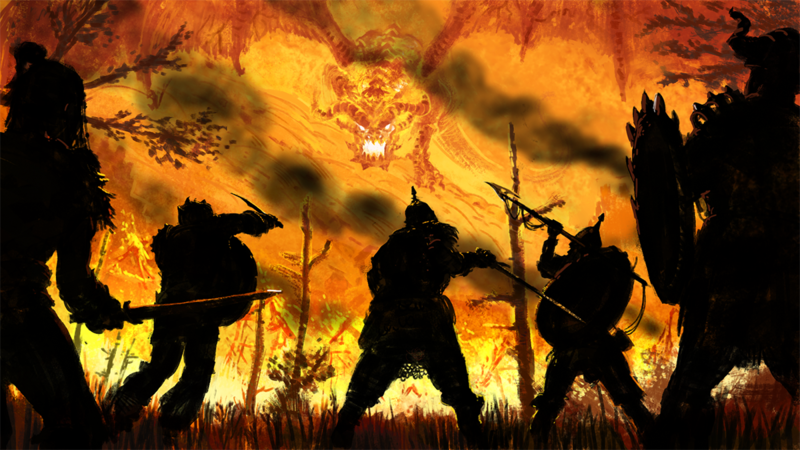 When two parties initiate combat, the drums of war echo and a pop-up screen appears in which the parties start to clash. A tab that lets the player look at his/her available shout/action skills. A panel that shows remaining energy types. Detailed information on both available and non-available shout/action skills. A text that shows which phase the battle is at right now. A text that shows which round is the battle is at right now. As soon as this battle screen appears, a phase called preparation begins, in which each character on both sides gets placed on the battlefield in an instant. There are numerous ways the battlefield will be filled with characters in order to create a refreshing atmosphere. We’re currently working on these to enrich the scenarios as much as possible. The fog of war (something to hide the battlefield so that we can’t see everything until the battlefield is ready) appears. The system randomly chooses a side and randomly chooses a character from that side. The system chooses a tile that’s closest to the center of the battleground as possible and places the chosen character. The system chooses a random enemy character from the opposite side and places it to a tile that’s adjacent to a randomly chosen, already placed character. The system continues to repeat the process until all characters occupy a tile in the battlefield. Every character in the battlefield chooses an enemy to target by marking it with an arrow towards that character’s tile. The fog of war disappears and we see the whole battleground. This whole process happens at the beginning of each battle, and then everything except for the fog of war repeats in subsequent rounds. Then comes the Shout Phase. But before we dive into further phases including this one, let me talk a little bit about how our skills and classes work together with our characters. In TFM, every character has a chance to become an adventurer, but their prowess depends on their commander, and yes, that means YOU! Becoming an adventurer in TFM mechanically means that the player spends resources to grant chosen characters class traits (Fighter, Ranger, Rogue etc.). These class traits come with several perks embedded inside of them and they can be upgraded throughout the game, growing stronger with the character. These are usually passive abilities with procs & triggers that the player can strategize around during a battle. They also provide 3 combat attributes called Health, Damage and Armor, shout skills and action skills. Health represents a character’s will to live and it works as expected When this combat attribute reaches 0, the character dies. We’re experimenting on several ways to enrich this dire situation, like having the characters become unconscious on certain situations, but those are only ideas as of now. Damage represents a character’s ability to deplete their targets’ Health during the Combat Phase. Armor represents a character’s ability to decrease incoming damage during Combat Phase. Each point of armor decreases incoming damage by 1. Damage below 0 increases the taken damage. During the Shout Phase, every shout skill of every character in the player’s party is shown in a list inside the Shout Skills tab, with descriptions and numeric information. There are five energy types, representing each color of the character attributes. Listed shout skills are there to increase the player’s energies when used so that they can be spent during the next phase: the action phase. We’re planning to have a basic shout for each color, but the class traits will also provide advanced shouts with cooldowns. These advanced ones will provide unique mechanics while still boosting up the energies. After the player chooses a shout skill and uses it to increase one of its energy types, the skills that are shown in Shout Skills tab becomes non-interactable, and the Action Phase begins, showing all the available Action Skills under its tab. Then comes the Action Phase. As soon as the action phase begins, the Shout Skills tab is replaced by the Action Skills tab. Switching tabs is useful when the player wants to check out available skills while not in that particular phase. Action Skills contain skills that deplete the player’s energies to provide powerful mechanics that can affect the battlefield. At first, all skills are in a state called unreadied. At the beginning of each action phase, X of them become readied skills, where X is being experimented on as of now. These readied skills are at the player’s disposal, meaning as long as there are available energy points, these will be available to use during the Action Phase. What differentiates Actions from Shouts is the fact that all readied skills in the Action tab are expendable when used; meaning they’ll become either used skills or exhausted skills and will deplete the energies accordingly. Once a skill is used, it is now the opposite side’s turn to use an action skill. This goes on until both sides skip their turn without using anything. It is important to note that the game’s time does not stop during these phases. Used Skills represents the collection of allused action skills. Used skills pile up in the list with a marker on them until there are no unready skills available, then they all shuffle back to become unreadied. Exhausted Skills are skills that are designed to be one-timers. Some skills contain a mechanic called “exhaust” on them, meaning that when that particular skill is used, it’ll be marked as “Exhausted” until the end of the current battle, which will disallow them to become (un)ready again. Lastly, the Combat Phase. During combat phase, every character who was placed on the battlefield tiles and has chosen a target with their arrow simultaneously deals damage equal to their Damage combat attribute. Any mechanic that’s supposed to resolve during this phase works accordingly, and the round ends. Rounds continue with the exact same cycle until one side gets beaten up or decides to flee. We have been working on our combat system for over a year now and have experimented with a lot of mechanics and styles. The first thought on our minds was to build a system that will not break a multiplayer 4X game-flow, like in turn based ones in which you have to wait for other players’ combats to conclude. We wanted to have something more agile and character focused with very important and meaningful player decisions. 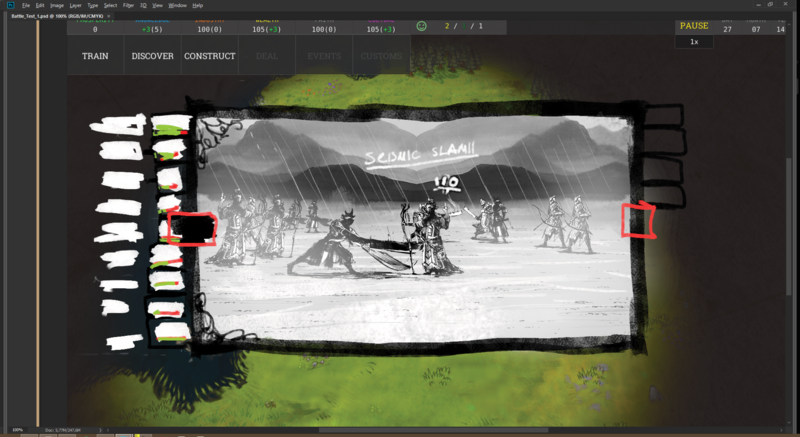 The 4 phase system allows us to achieve our goal of creating a seamless atmosphere where the game itself flows with all the battles simultaneously because they’re not instanced on another game-breaking screen. You can simply click on a battle cloud and see what’s going on inside while your other party is discovering natural resources to exploit. We’re still planning to implement a pause mechanic when you’re playing a single-player game in order to focus on your decisions more deeply without thinking about anyone else, and we will make this a gameplay option while creating a multiplayer session. The essence of our combat relies upon coordinating different classes and their skills in order to overcome different types of enemies because each of our colors (and dwelling races) have distinct combat styles and mechanics appropriate with their themes. A party flag in TFM is an important resource, and a party can hold only a certain amount of characters inside. Therefore, the decisions about designing a party and venturing through the whole wide world always feel like a dangerous, exciting and epic quest. We will be revealing more information about TFM's combat in upcoming updates, as we are currently testing many ideas and adding combat related content to the game. Salutations, ambitious children of Adam and Eve! 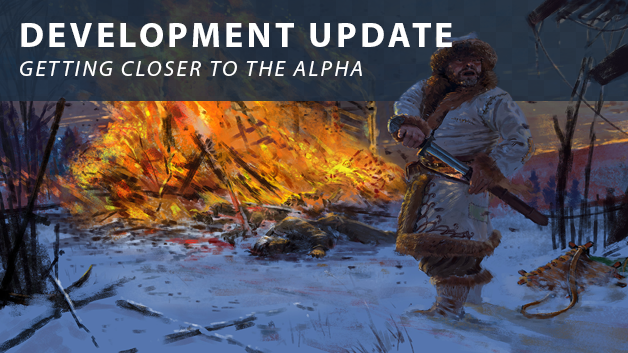 Today we're happy to bring you some updates about our development process. Starting from now, we shift our focus toward a new stage of development dedicated to evaluating all game content to date, improving performance, filling in remaining holes in content, and rebalancing existing systems. Most importantly, being ready to show off what we have prepared for YOU - not only to our great supporters at TFM Discord but to those who prefer having these regular updates in Steam as well. So we are excited to hear your honest feedbacks, comments, and critics to help us develop TFM - please leave your thoughts here - and/or join our Discord for faster communication! We’ve fully revised all of our settlement resources, character attributes, and main gameplay features. Inspired by Richard Garfield’s color pie - each color now represents a number of things in the game. In green color, we have “Prosperity” - the basis for the growth of new characters and the representation of food, shelter and all other things about the basic needs of your entire settlement. It is a collectible settlement resource with a store limit that maintains the characters as a consumption resource. You will be able to use this resource in a screen called “Paths” - investing in the characters you choose to let them gain new traits and attributes. Even letting a character to have the Pregnant trait will be done in this screen, so you will be using your prosperity to produce new characters. In blue color, there is “Industry” - a collective term for all physical, material resources, industrial tools that are used by characters in your settlement. Mostly used at building constructions and crafting new items while maintaining the tools of your workers. In red color, we have “Influence” - the representation of the power of your settlement. Managing this settlement resource is very important because it is the main upkeep for constructions and the only way to gain it is to execute numerous strategic actions. “Masteries” screen mostly uses this settlement resource - where you use your trained characters to unlock new things for your settlement. White color represents the “Unity” of the settlement, used to acquire “Traditions”, allowing a settlement to gain new gameplay features and bonus modifiers in certain areas. Black is the opposite of white - “Decadence” of your settlement, used to acquire “Corruptions”, again allows the settlement to gain new bonuses. For each of the colors, our character attributes remain untouched - each color has its own attribute, Green is Body, Blue is Mind, Red is Heart, White is Soul and Black is Self. After playtesting quite a lot of different styles for the city-building part of TFM, we’ve decided to move on with a Knights & Merchants inspired approach. Now you start the game with Adam & Eve along with a Gathering Tree. Soon we will be updating the customization screen of them too, with new features like starting the game with some children, traits, and items of your choice. Unlike K&M - you don’t use gold to create new characters, in TFM - as mentioned above - you will be using Paths screen for this. Every character starts his or her life cycle with an Element trait, basically defines main attributes. Path of the Young will be used to invest in characters during infancy and childhood periods, adding them Temperament traits. Vocational traits are basically jobs. You will shape the society of your settlement from the beginning, while even there are no crafters, leaders or soldiers - you’ll have six different types of collectors to choose from - Gatherer, Hunter, Forester, Farmer, Mountaineer, and Shoreman. They will be the backbone of your economy and unlock new masteries for you to educate better characters and to have more interesting jobs as you progress. Class traits define the characters you add to your parties. These parties will help you explore the world, meet other entities and complete your own defined objectives. There are a couple of different trait categories as well, like Aptitude, Personality, Genetic and Conditional traits - for the sake of this update’s length, we will be unraveling more information about them in later updates. So basically a cycle starts with these in hand; you invest in your characters, construct buildings for them to gain more settlement resources or to have adventures around the world - and with your income, you unlock new things to make your settlement better, in your chosen way! 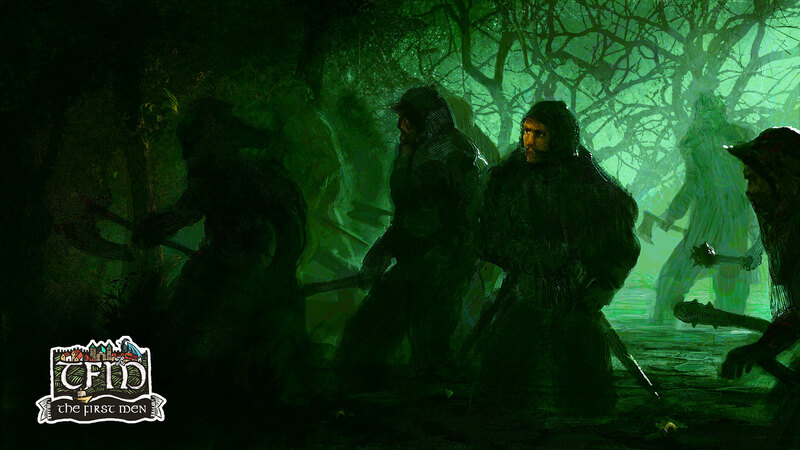 We’ve always been wanting so badly to give the players the ability to create and develop different kinds of societies just like we’ve been seeing in the universe of George R. R. Martin’s Game of Thrones. Now we’re very pleased to achieve our goal to have a player own strong, proud, superstitious and unruly people like the Northmen, while another one can shape fierce, hard and unbending sailors like the Ironborns! Tiles are the basic quantum of location in The First Men. 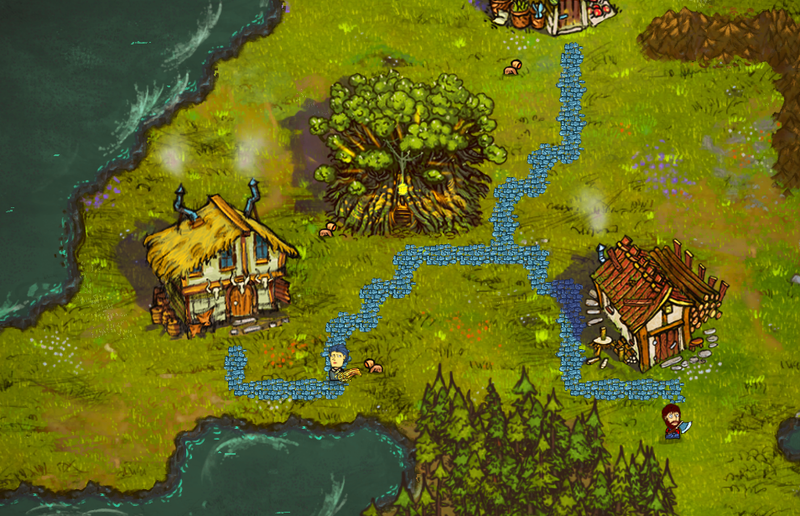 All characters, settlements, dwellings, resources, doodads, features and all other objects are located on tiles. Terrain encompasses the geographical features of the world. It consists of tiles, each of which possesses certain properties and gameplay effects. At the most basic level, the terrain is divided into biomes, which forms the main regions of the world, where most of the gameplay happens. 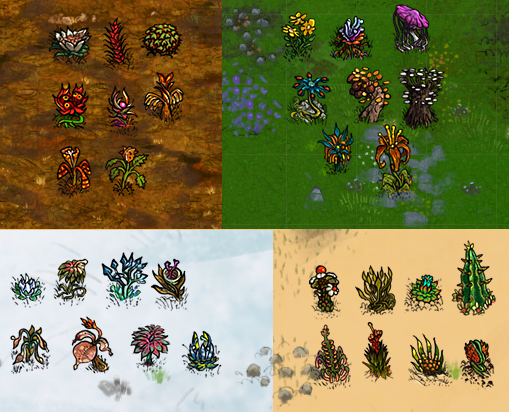 Player settlements always start the game at a Grassland terrain and slowly explore other regions named as Forest (green), Ice (blue), Mountain (red), Desert (white) and Blight (black). Besides these regions - rivers, lakes, and seas envelop the land and complete the world. Terrain features shape these regions; Primary features transform terrains and form smaller districts inside those regions. Shrubland, Tundra, Steppe, Barrens, and Swamp goes inside this category. During the dynamic world generation phase, AI uses the primary features to create new dwellings. Secondary features are super generic features. Caves, Sinkholes, Ruins, Caverns, Lairs, Nests, etc. are the places where most dwellings can be generated. And there are Tertiary features - super unique features, which are rare in most maps and do not have duplicates in the same map. We will be adding (and with our modding support YOU will be adding) these features for years since there are absolutely no limits to create new kind of stuff in this category. Terrain resources are special resources which give bonuses to visiting characters and will be used as objectives. Next up we are willing to implement our new combat system rework. Inspired by old Championship Manager games - we’re giving you a system where you will have more meaningful decisions and see the outcome of a battlefield much better! After that, we will be working on a big feature - Dwellings. They’re the core of TFM’s dynamic world and each of them will have their own objectives to achieve several different goals, using a system called GOAP (Goal Oriented Action Planning). More details about these subjects will be told in upcoming updates. The skies and the earth were joined together as one unit of creation, after which they have cloven asunder, going through a phase when they were smoke-like after they simultaneously came into a shape to live in. Six eras have been passed, the world and the cosmos have been created, all the creatures that walk, swim, crawl, and fly rise on the face of the earth from water. The angels, and the sun, moon and the stars started to dwell in the universe. The rain in torrents have been poured down, and the soil is broken up to bring forth the corn, the grapes, and other vegetation; the olive and the palm, the fruit trees and the grass. The earth is held to be inhabited by several other creatures, before that special act of creation; The First Men. Customization of the first man and woman with infinitely varied combinations. A character-driven gameplay. Body, Mind, Soul, Self, and Heart attributes with hundreds of traits and abilities offers a deep strategic gameplay, a rich and enormously diverse progress of characters to enjoy. Deep and immersive exploration. A vast fantasy world full of wonder rewards exploration as you traverse, discover, interact and learn more about the multitude of races you will encounter during your adventures. Settlement management with a tremendous variety of structures to build, upgrades and technologies to discover, and items to craft. 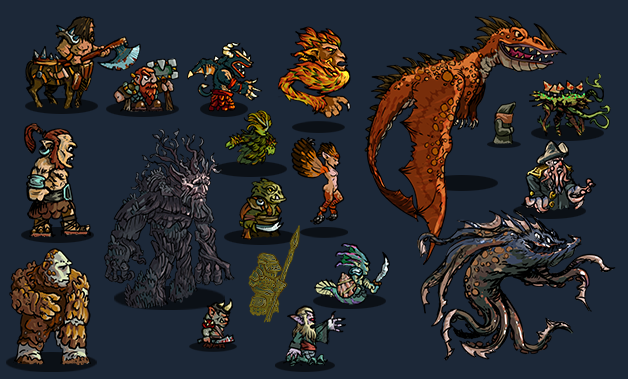 Expeditions in which each character is unique and carries his or her bonuses and/or disadvantages, gains experience, learns new abilities with a memory system, and progress while obtaining new traits and collecting shiny items around the world. 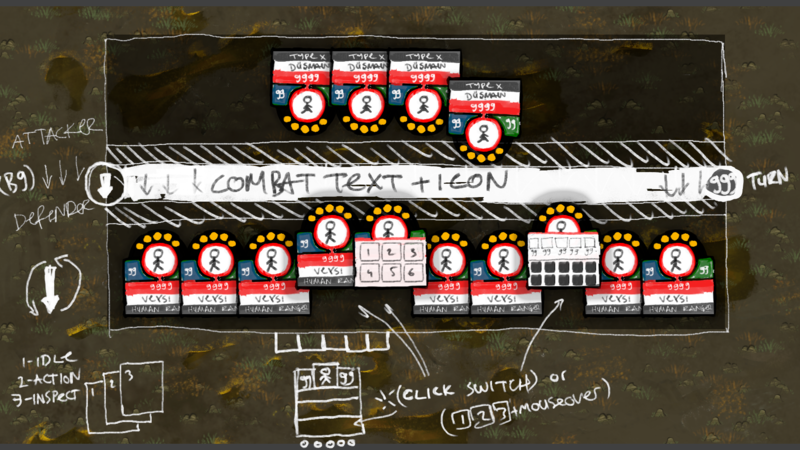 A unique real-time combat system using mechanics of a complex card game. Each subject you encounter, even a pack of wolves or a swarm of spiders, have their own cards to use. Detailed and stylish cartoony visuals set a distinct "fantasy-comedy" tone, reinforced by atmospheric animations, sound effects, and music. Different game modes for all players, scenarios with unique stories and victory conditions, skirmish maps for tailored competitions and random maps to add procedurally generated fun into the game, all available in both singleplayer and multiplayer sessions. Workshop support and an in-game map editor for crafting unique stories. © 2018 Pera Games. All rights reserved.